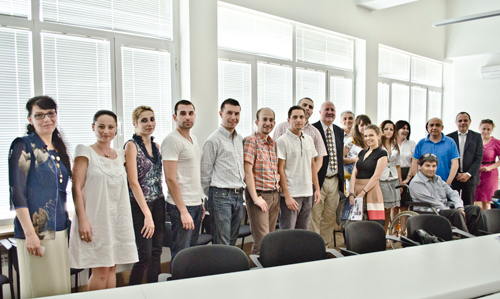 Sofia Business School is a high-level economic and financial master class project taking place in Sofia each year at the end of June and beginning of July. It originated in 2012 when its pilot edition was successfully conducted managing to attract a line-up of prominent international lecturers who shared their unique expertise on global risks management with outstanding students, young business leaders and local entrepreneurs. The master class programme is a joint initiative of the Reform Union Club, a distinguished corporate and public leaders’ club association in Bulgaria, and the New Bulgarian University, one of the biggest educational institutions in the country. Both organizations have dedicated significant effort and resources to lay the foundations of a business school that offers a systematic cycle of lectures, presented by renowned international professors and successful corporate leaders, encompassing the whole variety of financial and economic risks, their analysis and efficient management. Each of the topics featured in the program constitutes a focal point in the interaction between professors and students, academics and practitioners. The school is designed to be an effective medium for communication between mid and top level managers in the public and private sectors and MBA students on one hand and academic and corporate leaders thus facilitating the establishment of a viable exchange liaison between the academic and business communities. It aspires to build up multifaceted knowledge and professional networks that will be adding a valuable new dimension to lifelong vocational learning. The corporate figures who are invited to join the forum and share business leadership savvy are usually involved in discussions with the participants where challenging economic and financial issues are probed into by means of profound academic analysis on the one hand and fresh perspectives on the other. The direct exchange of insights between the lecturers themselves may only further enhance the quality of communication and legitimately turn Sofia Business School into “an international knowledge laboratory”.